Robert Montgomery is a Singer, Songwriter, Performer, Producer, Keyboard and Organ Instrumentalist, who began his music career in his early teens jamming with local bands in his small hometown of Rome, Georgia. The most notable being “The Sons of Aries”. Performing their own blend of rock, soul, and jazz, kept them very busy throughout the southeastern states. However, they never gravitated to recording any original material, and eventually disbanding. It was then that Robert began to write his own songs. One such tune was the soulful “I Need You Girl,” a song based on personal experience with his future wife, Emma. By now in his early 20’s Robert was an aspiring solo artist. Hooking up with a crafty local businessman named Jeffrey Jackson Jr, He entered the studio and recorded “I Need You Girl,” using guys from his former group who were by then called ‘Chain Reaction’. So the song was released on Jackson’s label, Crescent Records, but due to a shoestring budget the 1000 copies pressed were poorly distributed and the song never really achieved any great level of success. Following 12 months on the road with a group called Villaruz, in 1978 Robert moved to Atlanta. Following an invitation to join a band he’d heard rehearsing as their keyboard and organ player, Robert began a short tenure with the Michigan funk group “Ripple” who themselves had moved to Atlanta upon signing with GRC Records. Ripple recorded several hit singles for GRC including “I Don’t Know What It Is, But It Sure Is Funky”. Followed by the seminal album “Sons Of The Gods” for Salsoul Records in 1977, which featured their perennial disco/hustle classic “The Beat Goes On And On”. During a later period of reconstruction by Ripple’s band leader percussionist Brian Sherrer. Robert used musicians from Ripple to record four self penned songs as a vanity project which remained unissued (a situation soon to be rectified on a future Soul Junction Projects). With Robert hopes of a solo career again fading and now being a married 28 year old, he decided to put more emphasis on family life. Turning his back on a full time musical career he entered a new career in the insurance business working as an insurance agent for the next 30 years. 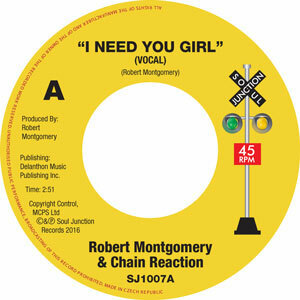 Robert remained oblivious that through the insatiable appetite of European record dealers and collectors alike in their quest to find Black America’s lost soul treasures, his 1976 melodic piano driven outing “I Need You Girl” had been rescued from total obscurity to become a highly appreciated and sought after modern soul favourite. Some circa 15 years after it was initially spun original 45 copies are still hard to come by. It was during his own quest to obtain himself a copy that respected German DJ Lars Bulnheim tracked down Robert Montgomery’s whereabouts and passed the lead on to us at Soul Junction Records, hence the release of this very hard and desirable 45. A scenario that has made Robert Montgomery a very excited man about this renewed interest in his lost music.